I sat on a cardboard box marked 'my stuff' in the middle of our living room. Beside me was the portable crib my newborn daughter slept in. Her tiny mouth curled slightly to one side; she was in deep slumber. I sighed in relief, beckoning a feeling of satisfaction to mark this moment. But instead, a feeling of overwhelm took its place. I scanned the room only to find the sea of boxes that harboured all of our possessions- remnants of my old life . A wave of reality settled in: I was a new mom. In a new house. In a new town. In the middle of nowhere, all alone. Sitting on a box holding the only passageway back to my old self. And I panicked. My secret had revealed itself: This was my new life, and I wasn't sure I wanted it. My secret rose from a place so deep, I barely recognized it was my own. This revelation took my breath away; leaving streams of tears in its place. Through blurry-soaked eyes, an object in the flower garden caught my attention. Wiping a stream of tears away, I saw that it was a butterfly; so beautiful it looked as thought it was from a different world. And there it was, in my garden. My elegant guest. I ran to grab my phone to take a picture, and as I returned, two more landed on the flowering purple bush. When Isabella woke from her nap, I scooped her up and fled to the garden to count more. We counted 23 butterflies in the garden that day. And the next day we counted 33. That summer, as we nested into our new home and lives, I would stop and count butterflies along the way. On my hardest days, I would find moments of joy, sometimes fleeting seconds, counting butterflies in the garden- and these moments gave me hope. 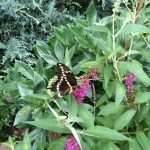 I would like to say that my healing and growth during my emergence into motherhood simply came from counting butterflies that summer (there is something magical, and comforting, in the notion that growth can occur so simply). But my growth into the resilient wife, mother, and woman I am today also took courage, strength, and support. My resiliency has become my travel-companion along my life-long journey of growth... but to this day, I still stop and enjoy counting butterflies along the way.